We hope you've felt inspired by Cherry's Words to Live By fabrics this week! Today we're sharing a virtual trunk show of Cherry's quilts made with her fabrics. Enjoy! "The title says it all. The quilts loo like city blocks with little connecting shapes. It's all appliqued, and it's the same block, just rotated so they connect. I used the appliques to create the transparent effect." 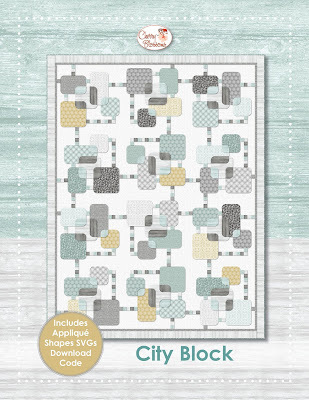 Click here to purchase the City Block pattern. 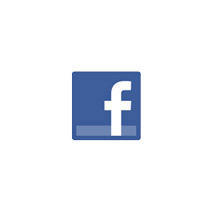 "This one is fun because it includes words. In my Front Porch collection, I had a bee print and really liked it. I started creating cute little sayings that started with "bee." It's a small and super easy project with a small amount of hand embroidery for the words and spirals." 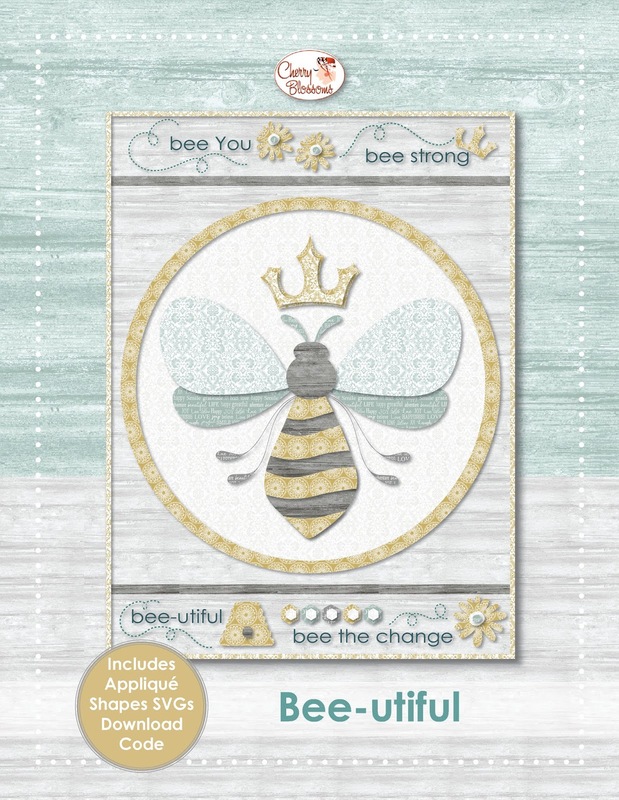 Click here to purchase the Bee-utiful pattern. 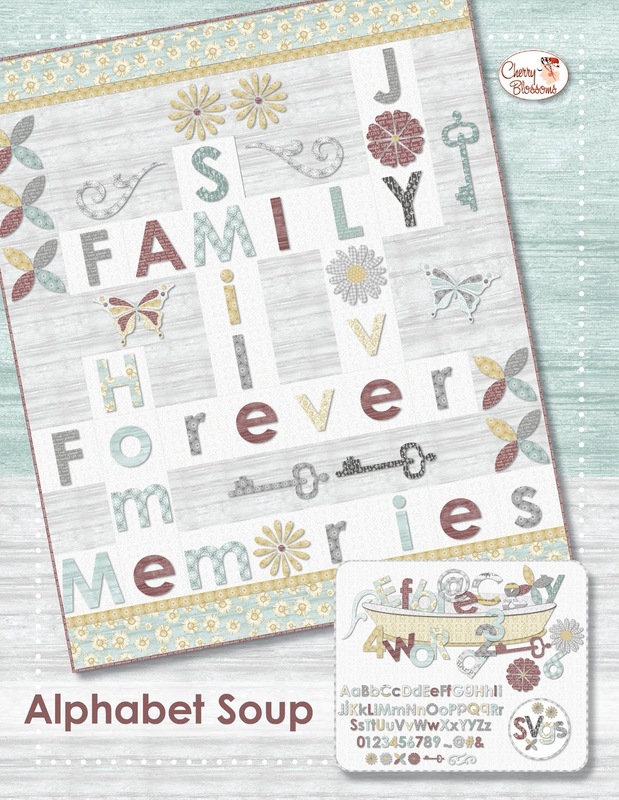 "This includes appliques for the entire alphabet in upper and lower case, plus the flowers and keys. The pattern comes with instructions to make the quilt shown, but you can also make your own word quilt. I give you the templates and a grid, plus a formula to figure out yardage, and you can build your own. There's also Alphabet Soup in the Hoop - for all the shapes done in a standard hoop on your embroidery machine. 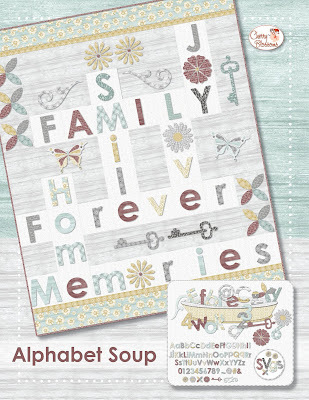 You can stitch out each letter with a satin stitch or blanket stitch finish. It takes all of 5 minutes to do a letter." Click here to purchase the Alphabet Soup pattern. "I'm teaching in Italy in October, so it was perfect to give this pattern an Italian name. I wanted this line to be home decor friendly. 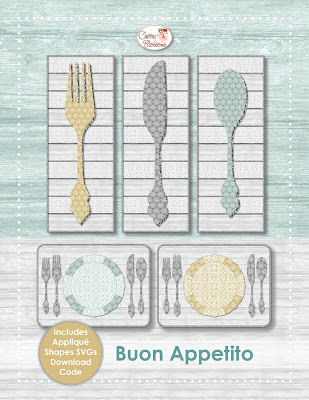 I used the idea of my Bon Appetit pattern but redid it with more elegance--more formal silverware on a pieced background made from the wood grain and lace print. The tables have an educational purpose--most people know where the fork and spoon go, but it's great to have on the kitchen table for when your kids or grandkids set the table." Click here to purchase the pattern. 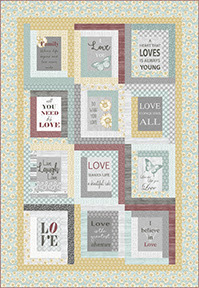 Cherry also created a free quilt pattern, Live By Love for her Words to Live by collection using the Love panel. Fussy-cut each block and surround it with pre-cut strips for a quick and easy quilt. Missed our previous Words to Live By posts? Click here to see the entire Words to Live By collection. Click here to read an interview with Cherry about her Words to Live By collection. These are beautiful quilts to show off these amazing fabric! Love the creativity with this fabulous line of fabrics! These quilts are just wonderful. I especially like the "scrabble" looking one. The fabrics are so beautiful.